Takeaway: See the results of an independent research and development organization that recently designed, built and tested fully insulated assemblies protected by leading thin blanket insulations for corrosion under insulation and thermal stability. Ames Kulprathipanja is affiliated with Johns Manville and can be contacted using the options on the right. For info on how we work with industry partners click here. Industry leaders continually strive to explore the best methods to provide information to the industrial market. Recently, an independent research and development organization designed, built and tested fully insulated assemblies for corrosion under insulation (CUI) and thermal stability in order to understand how thin blanket insulation performs in “real world” installation and environmental conditions. (For more about CUI, read Corrosion Under Insulation: The Challenge and Need for Insulation.) As part of the testing, the assemblies were exposed to harsh environmental conditions to accelerate corrosion and promote system aging. At the conclusion of the testing, the third-party agency analyzed the results, and we compared them to laboratory data based on ASTM specifications. The use of a third-party testing agency provides a number of benefits, including consultation and unbiased direction when designing and conducting the tests, as well as objective review and conclusions. This is why this new test method that studies the long-term effects of highly corrosive environments on insulated assemblies is, in our view, a comprehensive look at conditions that reflect “real world” performance. The first condition maintained the pipe temperatures at 45°F (7.2°C) throughout the test, periodically submerging the samples in up to 1,500 ppm chloride solutions, so that the assembly remained wet for the entire duration of the test. These conditions were sustained for a total of 6 months. The second condition periodically immersed the two assemblies in solutions with up to 1,500 ppm chloride. Throughout the test, the pipe temperatures were cycled between ambient and 600°F (315°C), causing “boiling” conditions for 18 hours each week for 6 months. At constant low temperatures (45°F conditions), the microporous blanket and the silica aerogel blanket have similar corrosion rates and depths. At high-temperature cycling conditions (between ambient and 600°F), the microporous blanket has lower corrosion rates and depths compared to the silica aerogel blanket. Deep, localized pitting is more significant in high-temperature conditions with the silica aerogel blanket than it is with the microporous blanket. Table 1: Mean corrosion depths measured (μm) by electrochemical methods after high-temperature cycling conditions. 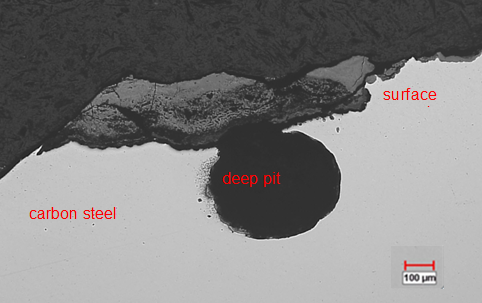 Figure 1: Optical cross-section of a carbon steel surface under the aerogel blanket insulation after high-temperature cycling conditions, showing deep, localized pitting. Deep, localized pitting is more concerning than uniform shallow pits. For the two insulation assemblies that were cycled to 600°F (315°C), the surface temperatures were recorded when the assemblies were dry (not submerged in water) at different times during the test (Table 2). The data show significant differences in thermal performance between the two blankets over time. Temperatures based on NAIMA 3E Plus® software for both insulation materials before and after thermal shift (change in thermal conductivity after exposure to high process temperatures) also show differences in the expected thermal performance. Thermal conductivities based on ASTM C335 (pipe geometry) were used for the modeling calculations (Figure 2). Table 2: External metal sheathing temperatures after repeated wet/dry and high-temperature cycles. NAIMA 3E Plus software modeling values before and after thermal shift are shown for comparison. Figure 2: Thermal conductivity values tested via ASTM C335 before (1st cycle) and after (2nd cycle) thermal shift. Note the thermal conductivity values for InsulThin HT do not vary between the 1st and 2nd cycles. At 600°F (315°C) process temperature, the microporous blanket performs as expected and has better thermal performance than the silica aerogel blanket – both initially and after 6 months of wet/dry and high-temperature cycling. 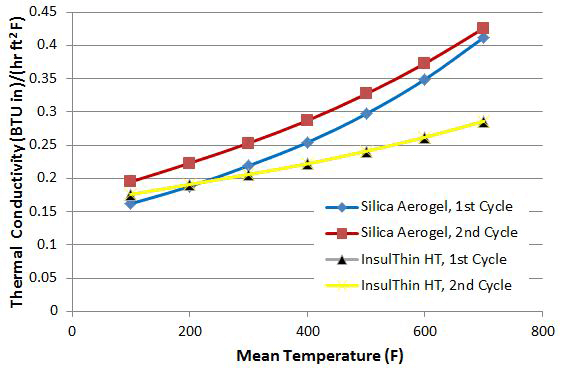 The silica aerogel blanket has a higher degree of thermal degradation when compared to InsulThin HT after 3 and 6 months of wet/dry, high-temperature cycling conditions. A thermal degradation of the silica aerogel blanket has been demonstrated in “real world” conditions by the third-party agency testing. Modeling calculations capture the initial thermal shift, but not the longer-term thermal degradation that may be due to high-temperatures and/or exposure to water. Understanding how “real world” or accelerated conditions may affect insulation test assemblies provides end users with critical information when specifying different materials. The results from the third party testing just described are relevant when designing insulation thicknesses, predicting system longevity, and calculating labor and material costs. Depending on the requirements of the application and the environmental conditions of a project, additional insulation material may be required or the system may need to be repaired more often than planned. The new, third-party data provide an independent and comprehensive perspective when choosing materials that can significantly impact system performance and safety. Ames Kulprathipanja is the Innovation Leader for the Insulation Systems business unit of Johns Manville as well as the Technology Leader for the Industrial Insulations Group. He is responsible for understanding the emerging needs of owners, engineers, and contractors and developing new products for the insulation market. He also leads the technology group for industrial products including technical service and core product support. Ames has spent the majority of his professional career in the residential, commercial, OEM, and industrial insulation industry. Ames has a doctorate in chemical engineering from the University of Colorado-Boulder and worked on various energy technologies including thermal management of complete fuel cell and gas-to-liquid fuel systems before joining Johns Manville.